Bi-fold specialist TWR Trade Frames has added a new National Sales Coordinator to its team. Tracey Ogden will head up the company’s dedicated bi-fold support service, administer sales enquiries and provide technical product support to customers. In 2012 TWR Trade Frames officially launched its bi-fold support service, helping installers enter the lucrative bi-folding door market. 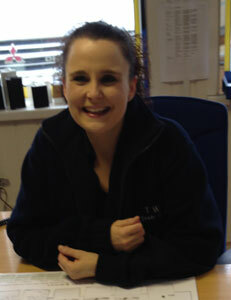 The scheme proved a huge success and the company is looking to build on its progress with the appointment of Tracey. TWR’s Managing Director, Terry Richardson, comments: “We will be rolling out a major new initiative in 2014, which will build on the success of our bi-fold support service. Tracey will be integral to this and she is already making a big difference. In 2013 TWR announced that it had invested in an in-house powder-coating facility; ensuring that it can now offer its customer’s faster lead times on aluminium windows and doors. TWR manufacture the eternAL aluminium bi-folding door, which is a re-brand of the Smarts Visofold 1000 and 4000 series. It provides excellent thermal efficiency, high-spec security features and super-slim sightlines.